I have never baked a pie before. I always known someday I would break the unknown resistance to baking pies. It was my husbands birthday a few days ago and I wanted to make something special for him. Looking through all the baking books I was having a hard time making up my mind as to what to bake. In the end I gave the book(Home Baking by Parragon Publishing) my friend Dhanu had gifted me and asked him to pick out something that he would like to try. 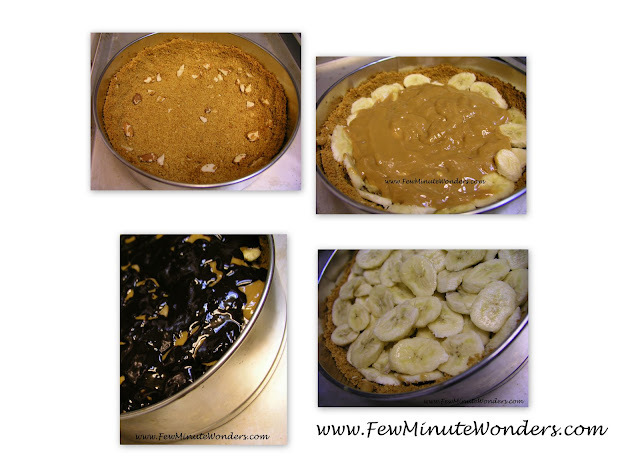 He picked the Banaoffe Pie for its simplicity. So I set out to do something I have never prepared before. I did make a lot of changes to the recipe from the book as I had to make do with ingredients I had at home. 1. Place the tin of condensed milk immersed in a sauce pan or rice cooker full of water and cook it on low for 2 hours. When that is done remove, open and allow it to cool. 2. In the meantime powder the almonds and the graham crackers into a coarse mixture and add melted butter in the microwave and add that to this mixture. 3. Coat the spring form pan with some butter and then add this mixture to it and distribute to form the pie base /crust and place it in the oven at for 12 minutes, remove and allow to cool. 4. Cut the banana into thin slices coat them with some lemon or range juice and place it in the baked pie crust. Spoon in the cooled condensed milk over the banana and continue to layer. In the end add some melted chocolate and allow to set in the fridge for 30 minutes to an hour. 4. Cut an serve then with some whipped cream. Delicioso!!! A very interesting pie recipe. Looks good. Birthday wishes to your husband. I guess he enjoyed the pie. I usually don't cook with bananas, but how can someone resist something so decandent yet so simple! This is a very simple yet tasty cake. Thanks for your efforts foodyguru! Nice change from the usual cake.Hope he liked it!